From left are past Empowered Woman honorees Sondra Chester, 2013; Mary Pauline Blazer, 2014; Ann Bogard, 2012; Jean Rutan, 2009; and Ellen Spinner, 2010. Ce Greene, Empowered Woman of 2011 was unable to attend. 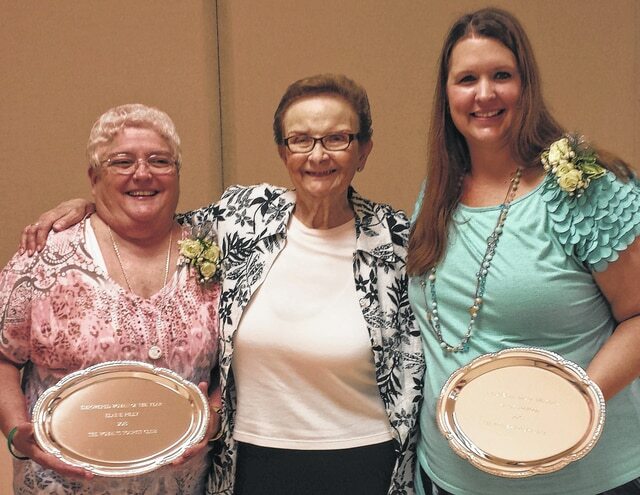 From left are Elaine Riley, 2015 Empowered Woman; Pat Moore, Woman’s Tourist Club president; and Stacey Logwood, 2015 Emerging Leader. The Woman’s Tourist Club honored 2015 Empowered Woman Elaine Riley and 2015 Emerging Leader Stacey Logwood at a dinner meeting at Burnham House in Goshen Park on May 18. Club members, family members and friends of the two women gathered to recognize them. Riley had a leading role in the formation of the Champaign County Relay For Life, helping to raise thousands of dollars for the American Cancer Society. She is an active participant in the Mechanicsburg Marketplace Bible School by being the photographer and organizing the kitchen so the children get their snacks. She is active in the United Methodist Church of Mechanicsburg. If there’s a job that needs attention, she doesn’t wait to be asked, but simply digs in and sees the job through. She serves on the Board of Trustees and is co-financial secretary. She participates in and promotes healthy activities by attending YMCA classes and encouraging others to join. She welcomes others to join her on her walking schedule. In the winter months she is the leader of the Bone Strengthening Class. She touches many lives in the community in many ways. Stacey Logwood is first and foremost a dedicated and loving mother, but finds time to help families and children in need in Champaign County. She works with Child & Family First Council; Help Me Grow; Champaign County Drug Free Youth Coalition; Parents Who Host Lose the Most campaign; Children Service & Mental Health boards; Sycamore House; Stepping Stones; Board of Developmental Disabilities; and Suicide Loss Prevention Team. She assisted in finding funding, resources and support for these organizations. She assisted in an eye-opening drug survey of junior high and high schools, resulting in a grant to educate youths as well as key players in youths’ lives. She educates the community on topics such as poverty and sexual abuse prevention and offers support to families following a suicide. Through her experiences, she has learned to empower and honor others. Riley joins Woman’s Tourist Club’s previous Empowered Woman Award winners Jean Rutan; Ellen Spinner, MS, CNP; Ce Green; Ann Bogard; Sondra Chester; and Mary Pauline Blazer. Logwood is the first Emerging Leader Award winner. Also at the May meeting the club officers were recognized. The officers for 2015-2016 are President Pat Moore; Vice President Phyllis Powers; Secretary Kay Miller; Treasurer Jean Rutan; Corresponding Secretary Sharon Bumgarner; Parliamentarian Carol Zoppa; and Auditor Pat McElroy. The club’s next meeting will be in September with a potluck for members and guests.